Charisse Gooden works in the health insurance industry. Her sister, Shan, is a teacher. Her father, Charles, is a retired firefighter. Now, they're all restaurateurs. The three of them plus Charisse's brother, Charles, decided to open a restaurant after the matriarch, Charisse's mother Rosalind Martin, passed away in early 2015. "The inheritance was taxed so heavily, my sister said we need to do something," Charisse says. Her sister also noticed the old Prohibition Lounge space at 94 S. Front was up for lease and urged Charisse to go look at it. A meeting with Prince Mongo and his bare feet and the Zambodia Ambassador's rapport with the Chief (Charisse's dad's nickname), and they were signing a lease. 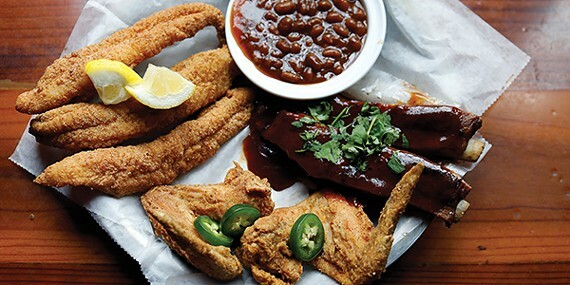 The family debuted the restaurant, named Cafe 7/24 in honor of Martin's birthday, in December of last year with its grand chandeliers, its New Orleans-style balcony, and its old-world exposed brick and ironwork and the kind of fanfare it, and Martin, deserve. 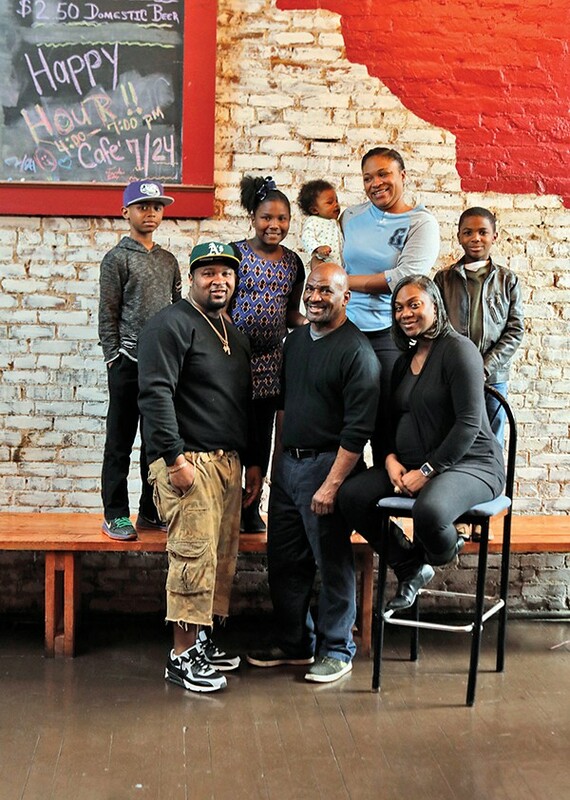 Charisse Gooden and family debuted Cafe 7/24 in the old Prohibition Lounge space. "We had a pop-up shop downstairs and a DJ," Charisse says. "It was packed out. It was beautiful to see so many people come out and support us." They built the menu around the Chief's experience cooking in the station house. "Dad has always been a griller," Charisse says. "He would grill stuff for people for the holidays and call it Chief Gooden's Smokin 'Cue." They added his knock-out catfish, burgers, fried chicken, a sampler platter, and Charisse's creation, Loaded BBQ Fries — crinkle fries topped with chopped pork, the Chief's barbecue sauce, cheese sauce, and a dusting of dry rub ($9). 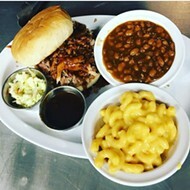 They offer a menu of signature drinks and a special for Grizzlies games, the GrindTime Grub, served from 6 p.m. to close during Grizzlies home games which includes their special Delta burger, fries, and a domestic bottled beer for $10. Charisse looks forward to hosting poetry slams in the downstairs area, which is also available for rent, as well as trivia nights and karaoke. Most of all, she's glad she's found a way for the whole family to honor the woman a whole community looked up to. "My mom was a principal for Memphis City Schools for 30 years," Charisse says. "When she was in Frayser, which was run by gangs, she turned it around in one year. She was a boss." Cafe 7/24, 94 S. Front, 590-3360, cafe724.com. Open Monday through Saturday, 11 a.m. to 8 p.m. It's all about family for Tamra Eddy, too. She had been looking to branch out and open her own restaurant, putting feelers out with family and friends, and someone suggested she take a look at the old Imagine vegan restaurant space on Young. She did, and decided against it, but one more trip to the house-turned-restaurant space and a car-sitting session, and something sort of miraculous happened. "I looked up, and at the cross street I saw my father's name," Eddy, known as Chef Tam, says. 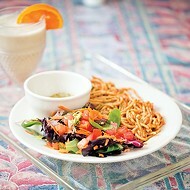 Chef Tam's Underground Cafe sits at the corner of Young and Bruce, at 2299 Young, and has hit the ground running. "We opened a day and a half before Memphis Black Restaurant Week, and we took on that beast," Eddy says. "We had cars parked all the way back down the street and 30 or 40 people standing waiting on a table." They were waiting to get their hands, and mouths, on Deep Fried Ribs ($15), the Donut Burger (yes, that's a burger on a glazed donut, $10), and her signature Deep Fried Muddy Balls, macaroni and cheese with crawfish, crab, and shrimp, deep fried for $8. Or her butter rum cake that's "ridiculous" and her honey butter yeast rolls that "everybody goes crazy for." Eddy has taken the spot and made it her own, repainting the walls, redoing the electricity, and recently updating the patio, and she's looking forward to offering curbside service as well as delivery, by the end of April for the former and the end of the summer for the latter. Her favorite feature is the community table in the front room, which is covered and sealed with her grandmother's handwritten recipes. "I had that built with the thought that nobody sits and talks to each other any more," Eddy says. "It has happened that people ended up sharing food, and they didn't even know each other." She learned from the best. 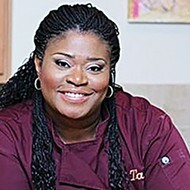 Her grandmother was a baker, her grandfather a barbecue pit master, and her father a chef with his own restaurant. "My slogan is Legacy Is Intentional," she says. "If we can just bring everybody together, we have the opportunity to change the world." Chef Tam's Underground Cafe, 2299 Young, 207-6182, cheftam.com. Hours are Tuesday through Saturday, 11 a.m. to 9 p.m.